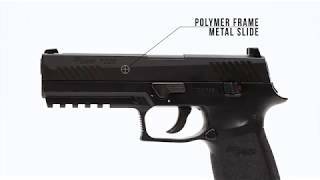 Please Note: Your P320 will feature a 30rd magazine, however, if you purchase additional spare magazines, Sig Sauer has reduced the capacity to 20rds. This 30 shot repeater debuted at SHOT Show 2017, and Sig Sauer has once again set a new standard for CO2 air pistols. 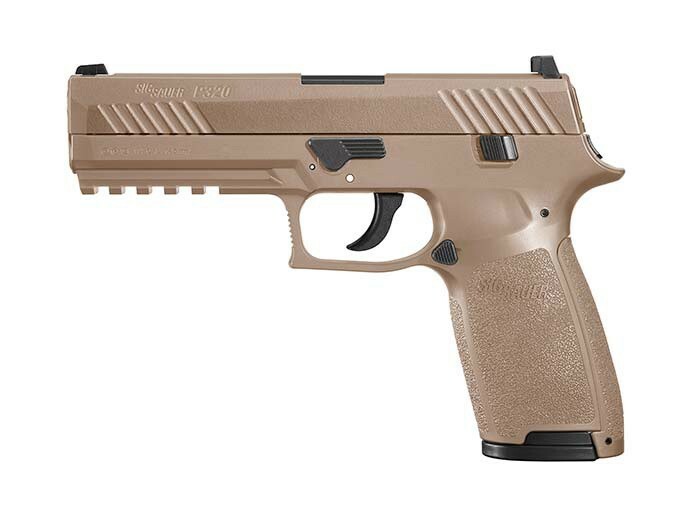 Built with a sturdy metal slide against a polymer frame, this Sig's claim to fame is its 30 round capacity. The first pistol of its kind, this belt-fed semi-auto is capable of firing both .177 pellets and BBs as fast as you can pull the trigger! Featuring realistic blowback, and fueled by a 12-gram CO2 cartridge held in the grip, you can propel your ammo choice at up to 430 fps (depending on ammo weight/composition). With this many shots, this pistol is great for hours of plinking fun! If you like CO2 replicas with more shots with less reloads, this is the air pistol you've been waiting for! I BET YOUR NOT USING WADCUTTERS . PLUS YOU SAID THE STEEL STORM IS JUNK? YOU MUST BE EITHER A YOUNG KID, OR JUST PLAIN EROGANT. I HAVE A P226 AND IT ONLY WORKS WITH WADCUTTERS. MY MCX ALSO. SIG RECOMENDS WADCUTTERS FOR THERE PELLET GUNS. THE STEEL STORM IS A BLAST AND MINE HAS USED OVER 1000 BB'S WITH NO JAMS, OR ANY PROBLEMS. IT DOSE EAT UP CO2 IN FULL AUTO. GET A GRIP DUDE! Things I liked: This is a great pellet pistol, the 30 round magazine is really nice, there are a lot of bad reviews about the mag but I just use crosman wadcutters and make sure they are seated right by running my thumb down the slots to make sure they wont stick out. Blow back is nice,and co2 is easy to load. Things I would have changed: It would be nice to see a little more detailed slide. What others should know: I would only use wadcutter pellets, pointed would probably get stuck in the barrel. The safety is a little bit stiff. Things I liked: Great pistol - easy to shoot and very accurate. I have the 30 round magazine that came with the gun and it fires fine with no issues as some reviewers have encountered. I've fired a thousand rounds through it and so far I've had only one pellet that stuck in the magazine and it didn't jam the gun. I do make sure to seat the pellets fully when loading by using a toothpick to push them down fully - that's it. Things I would have changed: I'm hoping Sig will start shipping additional 30 round magazines - it's 50% more fun to unload 30 rounds into a target than 20. What others should know: Well worth the price, but be aware it is not a realistic replica and does not breakdown like some people expect. It's great fun to shoot and that's it's purpose, so I'm sure focusing on shooting and not reproducing unnecessary features helped keep the cost down. Do the clips hold 30 rounds? Can you use crosman wadcutter pellets in this gun? Does this gun also shoot steal B.B.s?